A piece of sorority jewelry to cherish for a lifetime. The triple Pi Phi Sorority Ring is a sterling silver handstamped ring personalized with your favorite parts of Pi Beta Phi! Stamp your name, Pi Phi, your name & your big or lil sis, your school ~ the sky's the limit! Sterling silvers are approximately 3mm wide. Create a sorority keepsake to remind you of everything you love about Pi Phi! 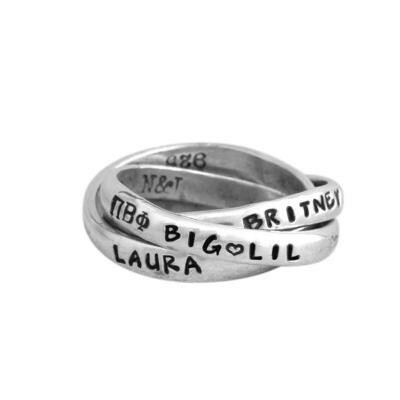 This ring is the perfect piece of greek sorority jewelry. Each band can symbolize a different part of your sorority experience. You can put your name on the first band, the greek letters on the second and maybe "sisters" or "Pi Phi Love" on the third. Or maybe you want to remember your big and/or lil sis, or maybe stamp the name of the college where you started as a pledge. It is up to you ~ anything you create will help you remember the sisterhood that will be a part of your life forever.